What I really should call this ice cream is “Kitty Cat” ice cream. My children are getting to the point where homemade ice cream is no longer impressive to them. They are so jaded. I try to tell them that not all mom’s make their kids ice cream from scratch. But they don’t believe me. When I made this, they were skeptical, but once they tasted it, they begged for more. “Mama, can I have some more kitty cat ice cream?” Maybe I still can impress them every now and again. This recipe comes from my new friend Susan Whetzel’s (we met at the glorious Dole event that I will tell you about later this week) book The Everything Ice Cream, Gelato, and Frozen Desserts Cookbook. It has tons of great recipes for all things frozen, and lots of helpful tips. I heard from a little bird the Susan might be having a gigantic giveaway over on her blog today. Go on over and check it out. And while you are at it, buy her book and have a summer filled with frozen deliciousness. I promise, you will not be sorry. 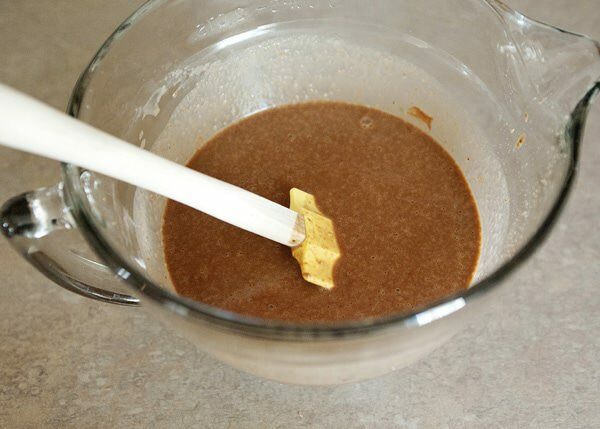 In a saucepan, combine milk, sugar, cocoa, malted milk powder, and salt. 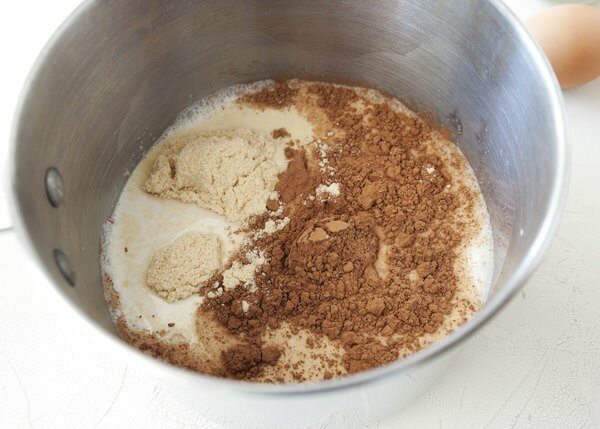 Stir and heat to a simmer until the sugar and cocoa is dissolved, do not let this mixture boil. 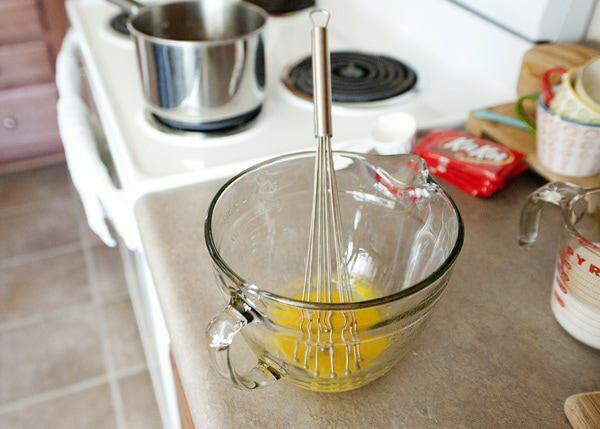 In a medium mixing bowl, whisk the egg yolks. 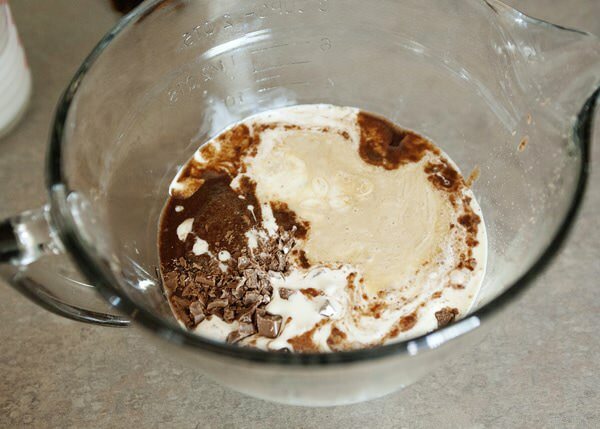 Drizzle half of the cocoa mixture into the eggs to temper them, you do not want scrambled egg ice cream now do you? Add the egg mixture back into the saucepan and heat until thickened. 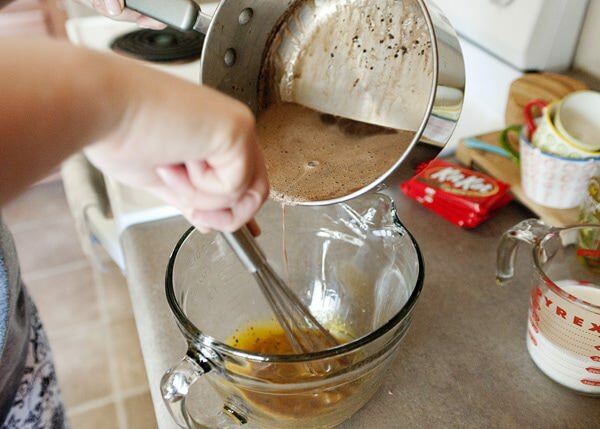 Take the egg mixture off of the heat. Pour it through a strainer into a heat proof bowl. 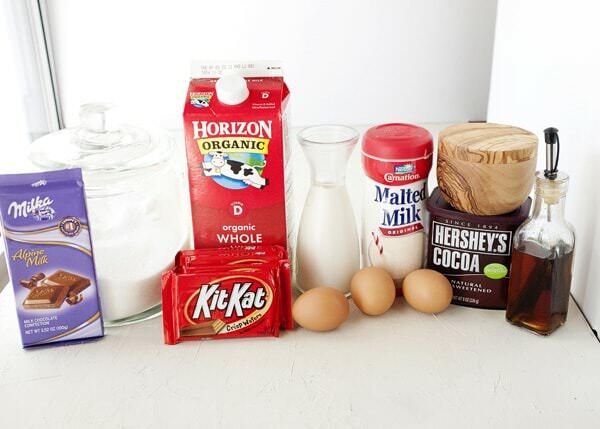 Add the chopped chocolate, heavy cream, and vanilla. Mix well, cover with plastic wrap, and chill completely cold, or overnight. Freeze according to your ice cream makers instructions. 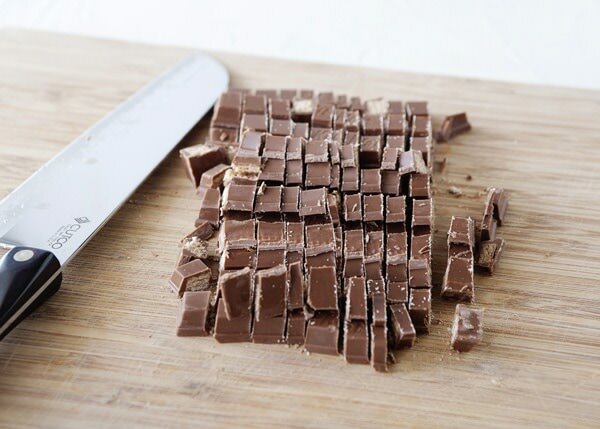 Chop the Kit Kat into small pieces. 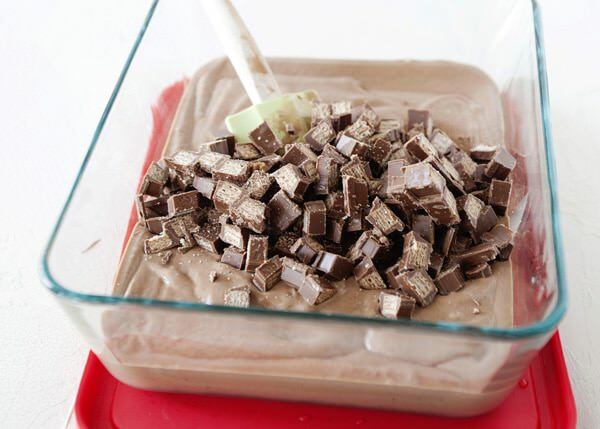 Pour the ice cream into a container and mix in Kit Kats. Freeze until the ice cream hardens. Garnish with Kit Kats. This looks and sounds so fabulous! How fun! That was a nice Mother’s Day gift. 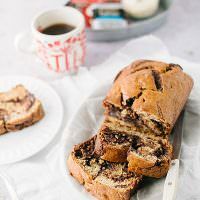 OMG- I am in awe of what a delicious recipe this is! thanks Liz! It was really fun to make too! You will love this then! I love a frozen Kit Kat! Wow wanna taste this delicious icecream! Don’t have a icecream maker, but when I see a recipee like this I know I want to have one! Your kids are so lucky Bree! Thank you Brenda, they are really a lot better than they used to be, and have come down in price. Get one, you will love it! Thanks Sarah! Crate and Barrel linen and a bowl from an apple orchard of all places. I’d feel like the luckiest person on the planet to experience one of your homemade ice creams! Kit Kats are one of my favorite candy bars from childhood. Looks like lots of flavor and a great crunch in that bowl! Why thank you Julia! Come on over and I’ll make you some! I’m totally making this!!! 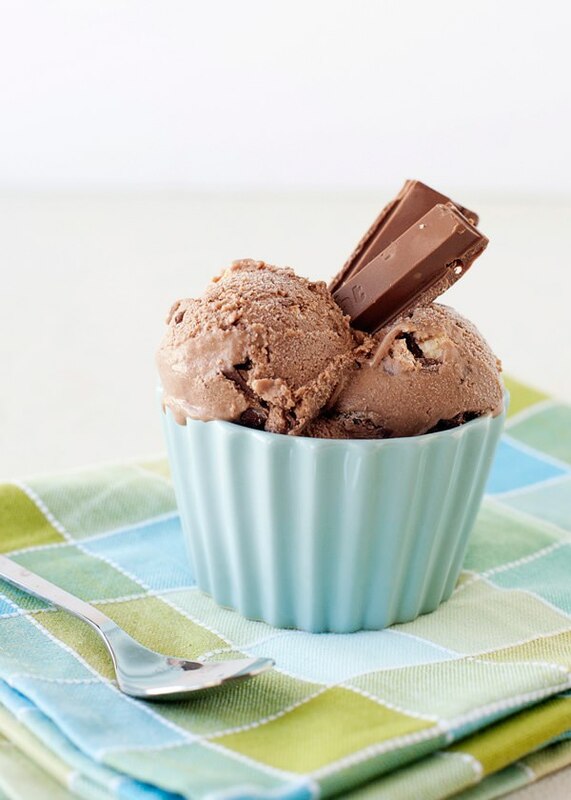 I bought an ice cream maker attatchment months ago…and it’s been in my freezer freezing…waiting… hoping I would make something delish like this… Yummm.. This would not last long in my house! Have fun with it! I love making homemade ice cream, it never gets old. Can you make this without an ice cream maker? What else can I use instead of malted milk powder? Not this kind, and you can just leave it out. We loved this ice cream so much I made an alternative version this week – one without an ice cream maker (I do get a little lazy sometimes). I thought I’d share with those who do not have an ice cream maker, but want to try your wonderful ice cream. It’s not exactly the same, but it’s a pretty good alternative! Whip all (except kit kats) together until stiff peaks form, then mix in the kit kats. Throw in the freezer overnight and it’s done! Thank you Rebecca! So do mine, they have no idea how lucky they are. This is so awesome, Bree! Kit Kat’s cannot be beat! I am going to have to make this for my boys! I started making ice cream last year and it’s still a treat to them when I do… even though I have 2 flavors in the freezer as I type this! lol! I love making ice cream! It is still super fun for me. Kit Kat is my favorite! What a great idea. This looks so good! thank you Becca, at least I can impress someone! this looks delicious. I am always worried about using eggs in ice cream. Thank you. I have mellowed so much about that, but I completely understand. 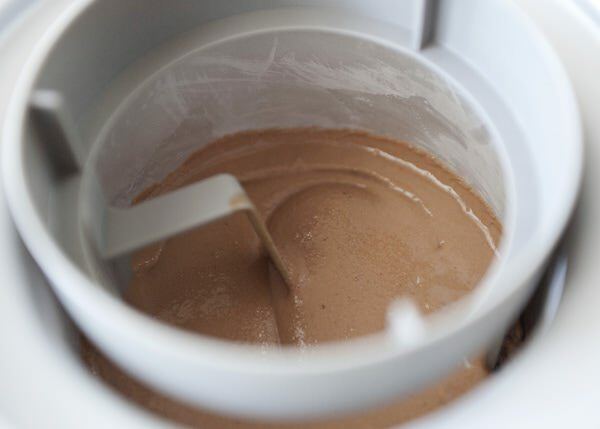 I just got an ice cream maker last week so I am thrilled that I actually get to make this! An ice cream maker is a dangerous piece of equipment! I love making my own ice cream! I made this for dinner tonight, it came together so quick and everyone loved it! Including Mr. Picky 4 year old that won’t eat anything besides hash browns and chicken nuggets. Thanks for a great recipe!! Sounds delish! Is the malted milk powder just for flavor or does it have an additional purpose? I don’t care for the malted milk flavor and would like to leave it out. Not sure what to substitute though. Any ideas? I’d just leave it out. It is for flavor. Kit Kats are my husband’s favorite! I can’t wait to make this for him when he comes home! Also, that bowl is SO cute! Thanks Amanda, I got it at an apple orchard of all places. Be warned – you will eat a lot of ice cream. They are cooked enough for me. I do not worry about it in the least bit. This looks delicious! Ok, off the wall question – where is that adorable bowl from?! I actually bought them at a farmers market, but when I get home (I am in the airport right now) I will see if I can find out who makes them. Milka?! Is that common in the US now? If it is, woohoo! My German husband will be very happy to learn that he won’t have to live on Hershey’s when we move back. I got Milka at the commissary, and we tend to get a lot of European brands. I am glad that I was able to impress you! Cute idea using Kits Kat Bars. We use to own a few vending machines. They were always a big hit. Thanks Andy! A frozen kit kat is amazing. That looks delicious. Last week I made Snickers Ice Cream and it was gorgeous. Going to work my way through all my favourite Chocolate bars now. Also good call with the Milka, I made Guinness and chocolate ice cream with Milka and it was lovely. Good idea. Heath and Almond Joys should be up next. Hi Bree! You have a beautiful blog…I always look forward to seeing what you are up to in the kitchen. 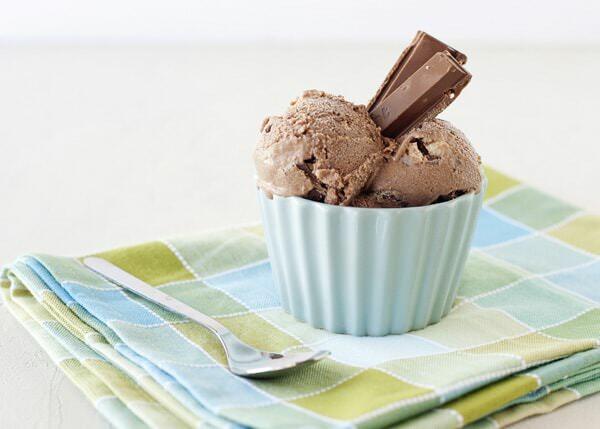 I made your Kit Kat Ice Cream last weekend and pretty much demolished all of it by myself (very dangerous stuff!). I adore Kit Kat’s and this was so fun to make. The addition of malted milk powder was just the right touch. Thanks for sharing! Thank you so much Gloria! I cannot take the credit, it was all Susan! This looks delicious! I will have to try this soon. It is Karen, making ice cream is so much fun. What size ice cream maker is this recipe for? This ice cream recipe sounds so delicious! I have a question though. My son is allergic to eggs. Would it significantly change the taste/texture of the ice cream if I omitted the egg? I would use this one as the base https://bakedbree.wpengine.com/chocolate-ice-cream and make it a Kit Kat version. I made this for my son (wink) this weekend and it was amazing! I try to save calories where I can, so with sugar being over 700 cal./cup (yikes! ), I did substitute it with a stevia based baking sweetener. I can tell it’s not real sugar, but the rest is so wonderful it doesn’t bother me at all. The only other thing I did differently was to put the kit kats in a gallon zip lock bag and crush them. I was careful not to pulverize them so we still got mostly whole pieces. It worked great! 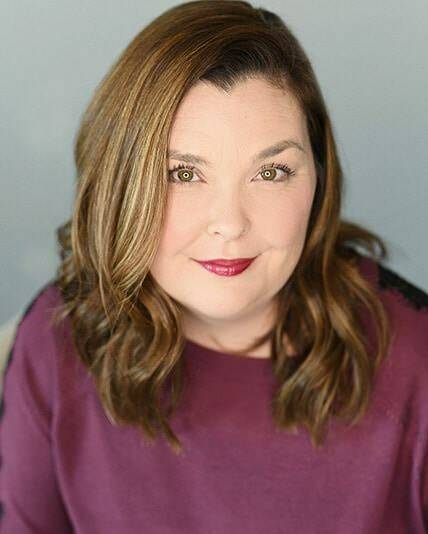 Thank you – thank you – thank you for sharing!